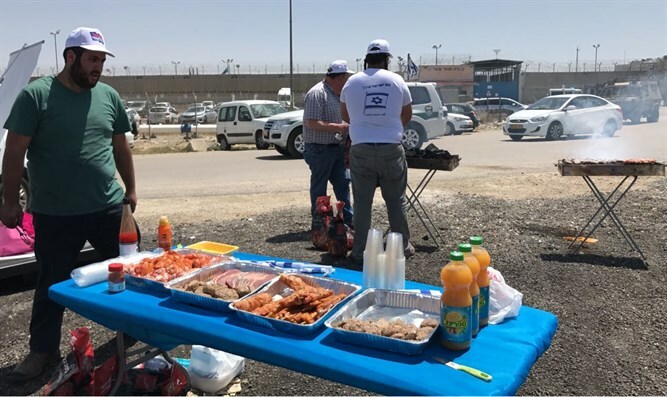 National Union Youth conclude barbecue in front of Ofer Prison intended to bedevil hunger striking terrorists. National Union Party youth arrived at the square opposite Ofer Prison near Jerusalem Thursday afternoon and held a mass barbecue aroma fest. After about 45 minutes, police halted the event and ordered the young people to leave. The purpose of the barbecue was to celebrate the hunger strike of Fatah terrorists imprisoned in Ofer Prison, where among others the leaders of the terrorist protest are incarcerated. The event was held to break the spirit of the terrorists and to call upon the Israeli government not to surrender to terrorist blackmail but rather to work energetically for the release of kidnapped soldiers Hadar Goldin and Oron Shaul.